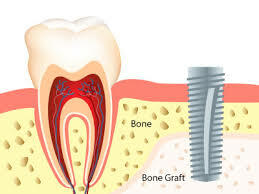 Sometimes, dental implant patients need to undergo a bone grafting procedure. When a tooth or multiple teeth have been removed, the jawbone near the site of those lost teeth can deteriorate or atrophy. Without a strong jaw bone, it is difficult to place the implant. Bone grafting is a procedure that helps strenghten the jawbone, ensuring that dental implants can be successfully put in place. Bone grafts can be taken from the patient's own body, often harvested from another area of the mouth, chin or jaw. We will use local anesthesia or IV sedation for this procedure, depending on the needs of the patient. Once the bone is transplanted at the implant site, it can take time for the jaw to be ready for the implant. However, if a patient only needs minor bone grafting, they may not need to wait. Your surgeon will make that determination, but patients should be aware that bone grafting adds another step in the process. If teeth are missing from the back of the upper jaw, bone deterioration can cause the sinus cavity to become larger. A sinus life is a bone grafting procedure for patients who have insufficient bone for dental implants in that sensitive area of the mouth. We will add bone to the area below the sinus so that the jaw can support dental implants. The procedure will not impact the patient's sinuses, and only causes minimal discomfort. Yet it will ensure that once dental implants are placed, they are strong and sturdy, feel just like natural teeth, and last for many years.